1. All of these films are some of the most critically thrashed in history, so I’m not expecting any complaints. Unless you consider a film like Monster A Go-Go a masterpiece, then this list will make you pleased. And I’m not trying to make this post mean-spirited, so if it appears that way I apologize. 2. With the exception of Battlefield Earth, North,and Troll 2, all of these movies are have been shown on Mystery Science Theater 3000. I don’t want to watch bad films unless they’re being ribbed. 3. If you think I forgot any bad films, you could give me a name that I might have forgot to put on or never have seen. I always like to hear others’ opinions. After Pulp Fiction, John Travolta became a star again. But then Battlefield Earth happened, and destroyed his career once again. The movie suffers from its unbearable direction (every shot seems to slanted), poor acting, and just ultimately feels like an advertisement for Scientology. Travolta, you deserve better. All of the Gamera films are quite bad, but Gamera vs. Guiron surely takes the cake. In this installment, there’s a kid obsessed with traffic accidents, a goofy policeman who the children affectionately call “Cornjob”, and a monster who (I’m not kidding) is a giant knife. It’s one of the most hilariously bad films ever made and made one of my favorite MST3K episodes. One of the most abysmal films ever made, Robot Monster is beyond terrible. Pretty much, aliens who look like a cross between gorillas and divers have killed everyone on Earth except for a single family. A terrible idea to start with, and the plot gets worst every passing minute. And the film makes no sense whatsoever. In one scene, the editor’s repeat the same take of the alien walking out of a cave in a row. A giant alien who looks exactly like a distorted carpet terrorizes a town and devours many people, which looks like the people are actually climbing in. But besides the terrible production, the film is mixes its dialogue narration and with the characters actually talking. Little films have been this hilariously bad. This is one of the hardest films to sit through. Pretty much an astronaut returns to Earth as a radiated being who kills any surrounding beings. The cast is repeatedly changed throughout the film, the climax rips off The Third Man, and the ending clearly shows that the filmmakers ran out of a budget and just tried to make a movie out of this mess. In casting the character of the brilliant scientist who becomes a mutated monster, director Coleman Francis picked Tor Johnson. Wow. Not only is the film poorly dubbed (the sound was destroyed in the shooting, so Francis had to record all of it later), but dreadfully written, horribly edited, and terribly acted. Francis has directed many stinkers, such as Red Zone Cuba and The Skydivers, but The Beast of Yucca Flats is by far the worst. Often described as the Citizen Kane of bad movies, Plan 9 From Outer Space ranks as Ed Wood’s worst movie, and he’s made plenty of those. It has some of the worst special effects I have ever seen (the UFOs are clearly on string), a horrible premise (aliens come to Earth to bring back the dead), and Wood even reused old footage of Bela Lugosi to put him in the film, even though they’re obviously out of order (shots turn from night to day, plus Lugosi’s stand-in clearly doesn’t look like him). I thought it was too entertaining to be called the worst film of all time, but this comes very close. No film is as awful, as horrible as Manos: The Hands of Fate. It’s horribly edited (every jump cut if off), terribly acted, and awfully directed. The movie contains scenes scenes that have no relevance to the story, such as a pair of teenagers kissing in a car or a fight between a group of women. And of course there’s Torgo, a character so awful he makes Jar Jar Binks look like Michael Corleone. In my review, I said “Manos: The Hands of Fate was intended to be a horror movie. 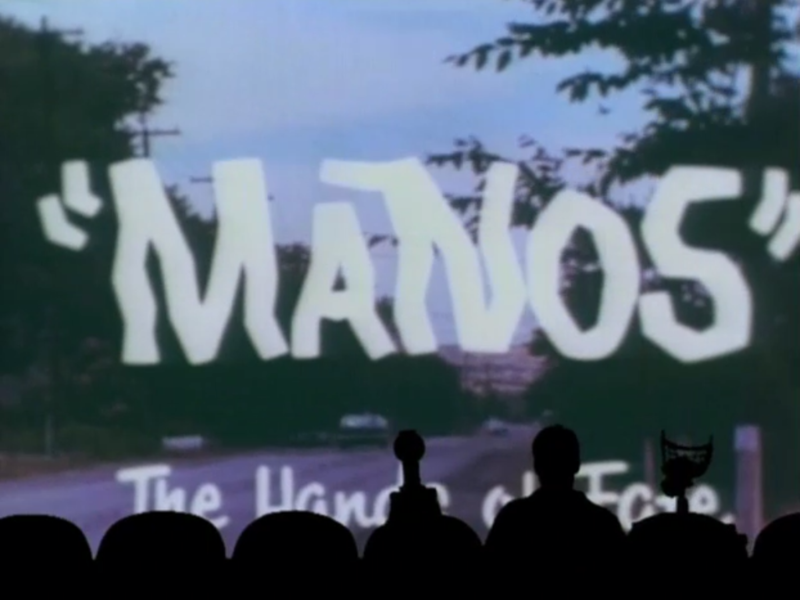 But the fact is nothing in the movie is remotely scary, but just stupid.” Manos was riffed by MST3K, which made one of the show’s best episodes, and RiffTrax will take on Manos this August. So at least something could came from this mess. I’ve heard terrible things of Jackhammer Massacre before, but have never seen it. Thanks for commenting! Coleman Francis’ “trilogy” can all be considered among the worst. There are plenty of terrible films, some that should not be forgotten so that people know how NOT to make a film. Or just use it as torture. Catwoman (2004), Leonard Part 6 (1987), Howard the Duck (1986), Batman & Robin (1997), Cool as Ice (1991), and the list goes on. And those are just the big name bad movies. There are plenty of low-budget stinkers out there, too. The ones on your list are famous examples, with cult followings. Try Killer Klowns from Kansas on Krack (2003). I should have considered Coleman Francis’ trilogy as one. That might actually be the most painful to watch out of all of my choices. I’d put Catwoman, Leonard Part 6, Howard the Duck, and Batman and Robin on my dishonorable mentions. I’ve never see Cool as Ice. I’ve never heard of Killer Klowns From Kansas on Krack before. Those low budget obscure films tend to be the worst. Thanks for commenting. Ebert gave the film a rare zero star review and used the quote for the title of his book “I Hated, Hated, Hated This Movie.” I’ve seen North, and completely agree with his review.